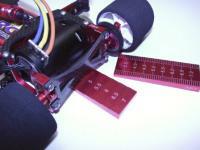 This new ride height adjusting gauge is perfect for the new CRC slider Pods (Xti). The stepped side with .5 mm levels and the angled non-stepped sided for more precise adjustments. The extra-wide gauge is great for the CRC Xti but the gauge works great for all cars, front or rear.